Quilt Batting & Bonus Giveaway Alert! Quilting inspiration galore – will YOU be the lucky winner? …or at least it will be for two lucky quilters. 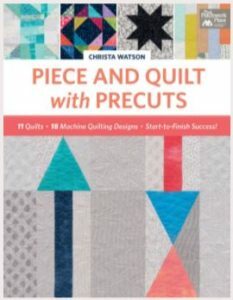 We’ve partnered with Christa Watson, author of the new quilting book, “Piece and Quilt with Precuts,” to award two lucky quilters with the Hobbs batting product of your choice – yes, your choice! We’re so excited about Christa’s new book – a book in which you’ll find quilts made with Hobbs batting and details on why Christa chose our batting for each project – that we’re inviting you to join her blog hop to celebrate its upcoming release…and to win a copy of her book from us! Check out Christa’s blog hop blog post here: Piece and Quilt with Precuts Quilt 4: S.W.A.K. To enter, leave me a comment letting me know how you prefer to buy batting – do you like to get it by the yard, in pre-sized packages, by the bolt, or some other way? and NOT here on our blog post. To enter, tell us about your favorite Hobbs batting, why you like it and where you prefer buying it (from your long-armer, or at a local quilt/fabric shop, big box store, online, etc.). and NOT on Christa’s blog post. it couldn’t be easier to enter! Then, share your thoughts in the comments below – tell us (on this blog post) how you use pre-cuts and you’ll have a chance to win a copy of Christa’s book, courtesy of Hobbs! Thanks for joining us for this super fun giveaway and blog hop – so much inspiration and freebies! Happy blog hopping and quilting! Want to be sure you never miss a fun giveaway like this one? about all the fun here at HobbsBatting.com! Thanks so much for your support! Hobbs batting is the best!! I have never used Hobbs batting, but have heard good things. I’d like to give it a whirl! I have used precuts to make whole projects, and I have used them in connection with complimentary yardage. I must also admit, I’ve used them as pretty decor in my sewing room–who doesn’t love the look of a jelly roll? I like using fat quarters, as I can get more cuts from FQ’s than other precuts. I do a lot of hand applique, so I can cut a few shapes I want from a FQ and still have enough for piecing fabric. I usually use 80/20 Hobbs from the box stores, but they and the LQS in my area don’t carry the cotton/wool. I would like to try that, but I want to touch and feel first, so I will have to wait for the next quilt show and hope they have it. My favorite is 80/20’whch I buy online in appropriate size as needed. Pre cuts…I lik to use charm packs to make bags. I live using fat quarter precuts and I like to make improv Quilts! I love 80/20 and buy mine by the package whenever I can find king size available. I use 2.5 in strips for many of my quilts, especially love making triangles from joined strips. I use a lot of your Hobbs Heirloom 80/20 white, and usually purchase it by the roll from a LQS. Love to use your Tuscany wool, and get it by the package for specific projects. I like to use pre-cuts in quilts where I want the fabrics to be well coordinated. Lately I have been using 10″ squares, cutting them to work in patchwork blocks. I use pre cuts in making quilts. I have used them for table runners and totes, also. I use Hobbs 80/20 bleached for all my projects. I buy it online . I buy my Hobbs batting in precut packages from my local shop. I would love to use the wool batting in ever quilt I make, but am worried about washing it in the machine, so save it forthe quilts I keep for myself. The only other type of goons I have used is the 80/20 and that is quite nice as well. I love the Heirloom 80/20 fusible batting! It makes quilt basting so easy to do. I learned about it from Angela Walters’ videos. I prefer to buy online, usually from Amazon or a quilt shop with a web store. Thanks for hosting the giveaway! I haven’t done a lot with pre-cuts yet (other than fat quarters, which I use for everything), but I’m excited to try a stack of layer cakes that I bought. I have used charm cuts for paper piecing projects because it’s quick and easy. Always use Hobbs Battings for my Baby Charity Quilts>which are my quilting passion right now! Usually purchase from Connecting Threads. Thank You for a neat giveaway! I have used several different Hobbs batting items, but my favorite is the Tuscany Cotton Wool Blend. Living in Iowa, the winters are very cold and I love that this batting in a quilt keeps us very warm! It’s also great to machine quilt with and allows a bit of shrinkage when washed for the squishy/lovely quilted look! I usually buy it online at Amazon. Used pre-cuts in many ways! A Favorite is the Charm Pack for making fast HST’s with precision.Using Layer Cakes for larger HST cuts! Love Christa’s Book+ideas! Thanks again for sharing! Precuts are my favorite way of collecting favorite fabrics! I don’t have to buy a whole yard and I can afford to get the collection, if I wish, with all the coordinating fabrics. I find it very easy to cut up fat quarters into the size blocks I need as I follow a pattern, or design my own improv blocks. Any scraps leftover are used to make patchwork baby bibs and handmade cards! My favorite batting is Hobbs 80/20. I love it’s drapeability and ease of use. I buy in large pieces (5 yards or so). Would buy a bolt if I had space. Thanks for your generosity. I mostly buy fat quarters because of their size and ease of use. Sometimes I will use a whole “set” for a quilt, but often I pick and choose the FQ’s from various sets for a quilt. My favorite is Tuscany 80/20 cotton and wool is my favorite and I usually buy it from a big box store or online. I love cotton. I buy from big box stores or local quilt shop. Bought once online when it was on sale at one of my favorite fabric sites. I like 80/20 best – I buy it from big box stores (especially with coupons) – my long armer buys it by the roll! I like fat quarters best for projects!!! I use precuts in a lot of my quilting. Nothing is faster than cutting out the time it takes to cut the same size piece of fabric over and over. They are also so easy to use in so many different designs. I like Heirloom 80/20, it is so easy to use. The finished quilt isn’t to heavy or bulky. I buy at my local quilt shop. Jelly roll precuts sure speed up my quilt making. I love precuts because the fabrics all coordinate and there is no more problems trying to match fabric colors. I typically buy 80/20 bleached batting wherever I find it locally. It’s affordable and the perfect loft. Haven’t tried Hobbs batting yet, need to give it a try! I’m not sure I have a favorite Hobbs batting yet. I suspect it might be wool, but I haven’t made anything worthy of it yet. I have some 80/20 and some fusible 80/20 I’m using soon. I bought it online at Connecting Threads. We don’t have a Joann’s nearby or I would probably buy it there. I seem to always cut precuts into smaller pieces, even if they’re charm squares. Tuscany Wool is luscious. Easy to stitch, so comfortable to sleep under. I usually buy it at the vendor booth at big quilt shows. I’ve never used Hobbs batting, so I can’t tell you which is my favorite. I do love to use a blend of cotton and polyester for my quilts, though. I find it holds up better than all cotton and is easy to work with than all polyester. Well, if you love using cotton and poly blends, then you’re sure to love our well-known Heirloom 80/20, which is 80% cotton and 20% polyester. It’s our most well-known and loved product and it comes in natural, bleached, black and fusible! I like the 80/20 cotton poly., and cotton. Purchased some from American Quilters Society. I love Hobbs Heirloom Premium 80/20 Cotton Blend. The loft and weight is perfect and I love how it is machine quilted with the longarm. I like the Heirloom Premium. I use it for machine quilting, it is easy to work with and I like how it quilts. I usually buy it prepackaged at a local fabric/quilt store and on sale. I don’t know if I’ve used Hobbs batting. I’m a new quilter but I’ve only bought yardage off the bolt — not sure of the brand. So far, I’ve used cotton/wool blends (I think they call it 80/20?). My go-to choice of pre-cut is the fat quarter. Big enough to make so many things! However, I have a quilt project in mind and I’ll need lots of colours in small squares so maybe a mini charm pack??? My longarm quilter prefers Hobbs. She uses wool followed by cotton in quilts that I will hang. For bed quilts I really like Bamboo or cotton. My favorite precut is a jelly roll but honestly I buy them all. I love precuts. I’m a new quilter and my experience with batting is very limited. I haven’t tried Hobbs batting yet, but after looking at all you have to offer, I’m looking forward to trying it! I will check at my LQS first to see if they carry it before trying other sources. I’ve been on a coaster-making kick lately, and 5″ charm squares have been perfect for them. They are also really nice for smaller quilts and table runners. I don’t think I have ever used Hobbs batting, but I would like to try it sometime. I usually use a cotton poly blend of 80 cotton and 20 poly because I like the way it feels and I like the shrink that happens when the quilt is washed and dried. I’m not very good at putting different fabrics together so I tend to buy fat quarter bundles or kits so I know everything will go together well. I’m loving the quilts made by the blog hoppers and would love a copy of Christa’s book! I just purchased two types of Hobbs batting last week – one wool and the other 80/20 and can’t wait to try it out. I bought it online and it is supposed to be delivered tomorrow. I haven’t used Hobbs before, but I have started to love cotton and cotton/poly batts. I’d love to try Hobbs! I prefer buying online or at my local quilt shop. We buy the Heirloom 80/20 black for many quilts. It’s great for my husband’s black and other dark quilts and I use it for bright children’s quilts. Thanks for the great give-a-way. Thank you for the opportunity to win twice on one blog. I love to use precuts for baby quilts and for quick comfort quilts when I hear about a friend in need. I have so many different precuts on hand that I often find just what I need to fit the personality of a friend going through a trying time. My favorite batting that I have used is Heirloom 80/20. It just gets softer and softer, making it great for new baby quilts.But I am really interested in your Tuscany wool and wool blend. I usually purchase at a big box craft and fabric store. I love to buy precuts in order to have all the prints in a collection. Fat quarters are my favorite followed closely by layer cakes. These give me plenty to work with as I love to make very scrappy quilts. I can get the most variety this way. Thanks for the opportunity to win Christa’s book. I want to make every quilt! Im just getting started with actually sandwiching my quilts. The folks around me always use cotton so that is what i got, but id like to try wool like Christa has said she likes! Thanks for the chance. On precuts – i like to get fat quarters for variety – but having jelly rolls and charm packs makes the projects go so much quicker – really a great way to go! I want to try precut hexies too. Chrusta’s ideas are akways so nice. Looking forward to her new book. I have loved using Hobbs 100% cotton Heirloom and Tuscany batting in my quilts! Hobbs has been *consistently* soft, high quality batting, and a pleasure to use! I recently bought Hobbs Heirloom Premium 80% cotton/20% poly, for a little more loft in a baby quilt… Looking forward to using that! Next I want to try Hobbs Tuscany Cotton/Wool, followed by Hobbs Heirloom & Tuscany Wool! (for even greater loft with lighter weight with more warmth!) I get my beautiful Hobbs battings at my local quilt shops! I love collecting and using precut fabrics! It is SO nice to have ALL of the fabrics in a particular line that I like!… And, having the fabrics already cut saves SO much time in preparations… So convenient!… I can get sewing that much faster! I have a roll of Hobbs batting in my sewing closet right now. I love it. I love the wool-so cozy without being hot, to sleep under. I use Hobbs 80/20, and buy the king size. Then cut it into wall-hanging sizes. Been my favorite for a lot of years. I ususlly buy it at Connecting Threads when they have sales. I’ve heard so many good things about Hobbs batting but have not tried it myself! I prefer an all natural batting in cotton and I’d love to try the 100% washable wool Hobbs batting. We make several battings composed of 100% cotton, two in our Heirloom line and two in our Tuscany line – one in each line is natural and the other in each line is bleached. We also make Heirloom Natural w/scrim, which has a stabilizing layer needle-punched into it, providing additional stability and the ability to stitch up to 10″ apart! And finally, we also offer Tuscany Cotton Wool which is 80% cotton and 20% wool. It’s a deliciously soft batting! We’d love to hear what you think of our wool batting, available in both the Heirloom and Tuscany lines – perhaps you’ll win some?! I use layer cakes for quick quilts when I need a handmade gift for friends and family! Just a few cuts and I’m ready to sew! I have never used Hobbs batting, but it must be a good products because most of the blog writers that I follow mention using it. Would love to try some! Thanks! Read via Christa about Hobbs Wool batting, so that is the one I’d love to try for the softness. I’ve not tried any of your products yet. Thank you! I use Fat Quarters mostly as far as precuts go. FQ’s are versatile and I use these firts for bigger quilted items like quilts, runners and my scraps from these precuts become coordinating pillows or small totes/bags. I use precuts for a quick fix – to get a quick and fun quilt done. Sometimes its because I need one to give away, other times its just for the satisfaction of completing a task. I have used the 80-20 Hobbs and really liked the feel of it. I have bought Hobbs package batting from my local quilt shop to try my hand at hand quilting. Regarding using precursor, I have only used once for a specific pattern for a class. Doesn’t mean I don’t have some in my stash though to use for a later date! Regarding using pre-cuts, I have only used once for a specific pattern for a class. Doesn’t mean I don’t have some in my stash though to use for a later date! Pre-cuts – convenient, inspiring, fun. Great when I want to add variety with coordinating fabrics without investing in yardage. Especially useful for charms quilts, traditional or modern. I love Hobbs fusible 80/20. It eliminates the worry about how to baste as the fusible is in the batting,just heat set. Recommend it to all my friends. I usually purchase through Connecting Threads. I have never used Hobbs. I have been quilting for about a year and look forward to trying all kinds! I have used pre cuts a lot and have enjoyed doing HST and jelly roll race quilts. I just finished a disappearing 9 patch with pre cuts that was quick and easy! I have subscribed so I get future updates from you, thank you!! I have a bolt of your 80/20 batting and I love it! I’ve been using it for the last two years and I still have a lot left. I just bought two packages of the wool batting to use in a quilt I’m making for my bed. Can’t wait to finish the Top so I can try the wool! I like the 80/20 batting best. I have bought many queen size packages of it, usually at a local Michael’s store. I use pre-cuts in various ways. A charm pack is great to make a quick table runner. I sometimes combine a layer cake with fabrics from my stash to make a lap quilt. And I often use leftover bits from various pre-cuts in scrap quilts. I love the wool batting and use it for special quilts but I generally buy the natural cotton. It feeds well on my longarm and is love to run my hands over the batting. Thanks. I’m enjoying the blog hop and appreciate all the different takes on Crista’s quilts. I mix all sizes of fabric. Depending on the pattern I have FQs, layer cakes, jelly rolls, and yardage, all of which I use. I like the scrappy look and having an entire collection that I know goes together sometimes makes it almost too easy to make a quilt. They are so handy. Thanks. My favourite is Hobbs Heirloom Premium batting. My favourite precuts are jelly rolls. I love using them to make lap quilts. I have not used Hobbs batting but am working on a quilt that I want to use wool batting, so I have been doing my research. Thanks to Christa’s recommendation, decision made, Hobbs it will be. I usually buy my batting on an as needed basis unless it’s on sale! I also like 100% natural cotton batting and would love to try Hobbs batting!! Thanks for the chance!!! Please see the list of available cotton battings in my reply to Michele above – any of these could be fun to try. Good luck on winning some! I haven’t used Hobbs batting yet, but I’d love to! I typically shop for batting at our local quilting store first. If I don’t find what I’m looking for I head online! I like Hobbs 80/20 because it doesn’t shrink as much, especially for more modern quilts. For more traditional I like the 100% cotton. I’ve never tried the washable wool but think it would be lovely on traditional quilts. I used the heirloom 80/20 for the first time in my latest finish. I LOVE it so much! I have to use up the stock of cotton I have then I’m wanting to switch. Good stuff! I like the feel of the Hobb’s 80/20 when quilting and after washing the quilt. It is easy to handle and sews wonderfully when I am free-motion quilting. I use a low loft most of the time. Pre-cuts are a fun and fast way to put together lap and baby size quilts in a short amount of time. Great for gift giving. I’ve never used Hobb’s batting but I’ve heard wonderful things about it. I will definitely try it some day. I think they sell it at my LQS, Augusta Sewing Center. I love your wool batting. Thanks for the chance to win. I have never used Hobb’s batting before. I am still learning which batting I prefer…100% cotton or a blend. I would love to try your’s! I love working with Fat Quarters and adding larger cuts if solids or a key pattern for the background fabric. I would prefer to buy it at my local fabric store or my big box store (Joann’s). I like to use my precuts on scrap quilts or for appliqué. Hello again. Christa book looks interesting. I usually buy charm packs. Recently I’ve started buying fat quarter packs for the larger cut of an entire line. I love charms, layer cakes and jelly rolls. Hard to pick a favorite. My favorite is 80/20 and I usually buy from Kingsmen Quilt Supply via website. I just think it’s a wonderful all around batting. I’ve used it for most of my quilts. I love how it washes up. I use jelly rolls to make the jelly roll race quilts and I’ve been using layer cakes to make chevron quilts and 10 minute block quilts. Would love to try some patterns from her book! I buy your Hobbs Heirloom 80/20 Cotton Blend Batting from a big box store by the yard. I love how it makes my quilts look cuddly soft after I wash them. Usually my precuts stay precuts until I can decide what to do with them. I need help utilizing them. I’ve only used Hobbs 80/20. I buy it by the 108″ wide 30 yard bolt from my local fabric store. I have several tubs of 5″ square that I precut. I have added purchased precuts to make hst quilts and like how they easily add additional color to my quilts. I love Hobbs 80/20 on a roll from Brewer for large projects, but I keep a stash of Heirloom & Tuscany cotton sample squares from Quilt Festival Houston for small art projects. My favourite is the Hobbs Heirloom 80/20. I love the way it handles and drapes in the finished Quilt. I just bought a whole roll from my LQS! I mostly use charm squares and fat quarter bundles to add more variety to my quilts but I have a stash of other precuts that I just need to find time for. I love getting the whole line all at once with precuts! I like the wool batting usually buy in my big box store or at a quilt show. The Cotton Wool blend is my favourite – delicious drape and a bit of extra warmth! I’ve been purchasing from Connecting Threads, and looking for somewhere to buy in Australia! I love Hobbs 80/20 batting for my longarm and I usually get it by the yard from local fabric shop. 80/20 is all I use. Looking forward to trying wool. I love the Hobbs’s wool batting. I like it because it breathes, it comfortable and easy care. I do recommend it to other quilters. I usually by it at quilt shows or Connecting Threads. I love Hobbs 80 20 and have a closet full purchased from a local quilt shop! My favorite batting (and I’m not just saying this for the giveaway) is Hobbs Fusible batting!!! I usually order it online because it’s hard to find locally. I buy my batting on a roll online. I have a longarm so it is easy to store under my frame. I forgot to say I like your 80/20 batting because it is light and has a good drape to it. I love using fat quarters and layer cakes to make quilts because this gives me a great variety of fabrics. I am so super new to quilting, iv purchased at Joanne’s once, and then off Amazon . I liked the ease of amazon but at Joanne’s I can touch and feel! So far iv used precursor to make a twister center piece for a future quilt I’d like to put in the middle of quilt top for my 4yr old granddaughter. I’ll be honest- I haven’t tried your batting yet. I typically use a cotton batting. I have heard great things about your wool batting as well! I typically buy my batting at a big box store, but online is also a really convenient option. I love precuts- especially charms and FQs. I love the flexibility of FQs, but charms are a great (affordable) way to get a little bit of each print in a line. I have used the 100% heirloom cotton, and love it. I haven’t ever tried the wool, but I would I would really like to. I love the 80/20 Hobbs batting. Always seems to be just enough. Normally I use the 80/20 and love it….but I’d really like to try the wool. I usually buy from my local quilt shop. Love the wool! I buy it online for special quilts, but hope to acquire a roll in the foreseeable future. I like to use jelly rolls because you can make the same quilt over and over with different fabrics and they look so different! I love wool batting. I always buy it in pre-sized packages. I like to use the Heirloom 80/20 and I buy it at Joanns. Have not used hobbs but would love to try the 80/20 heirloom batting. I prefer to purchase from the quilt stores. I Purchase packaged size required for the size quilt made. I have not used precuts to make my quilts. Have always cut my own shapes. There is always a first time for everything. Thanks for the chance to win christa’s new book. I love using your fusible batting from Connecting Threads for table runners. I have never used any Hobbs batting and am still fairly new to quilting. I would love to try some. Since I am fairly new at quilting I would use precuts as a starting point for my quilt piecing since it takes so long for me to cut large pieces into what I need. I love your Tuscany Wool Batting. It is so soft! It really makes my quilts feel warm and snuggly. I usually purchase my batting at my local quilting shop, but sometimes I purchase it online. Depending on the project, I will purchase pre-packaged or by the yard. Thanks! Also– I love pre-cuts. They are a great way to start a quick and easy quilting project. My favorite is the strips that I can turn into really cool triangle quilts. Who doesn’t love a great triangle quilt!! HI,new quilter here;bought Hobbs Batting and loved it;have not purchased anything else.Love it+currently have a box with a dozen crib size batts at the ready! Thanks for sharing! I have heard such good things about Hobbs Batting, yet I have never tried it. Hobbs 80/20 is all I use. I prefer it to other brands.And of course, since I’m a Texan, I have to support a Texas company. I have honestly never used Hobbs batting before. They dont sell it anywhere around here. I normally buy pre-cut pre measured and packaged at our local Wally-world store. No other choices available.☹😦 I would definitely try it if it was available in our area locally.